Why Is Figuring Out Your Body Fat Percentage So Important? Body Fat Scales – How Accurate Are They? It’s that time of year again. With the calendar rolling over yet again and a new year upon us, thousands of people are flocking to their nearest gym in hopes of finally building the body of their dreams in 2019. Some of them are hoping to increase their lean muscle mass. Others are looking to finally trim their excess belly fat once and for all. Regardless of which camp that you may personally fall in, it’s extremely important to be aware of what your body fat percentage is. There are numerous methods available to you for determining what your body fat percentage is. Some of them are incredibly accurate. Others are slightly less so. Today we’ll be taking a closer look at body fat scales in an effort to determine how accurate they are. So if you’ve ever found yourself wondering ‘how accurate are body fat scales?’ then read on for the answer. Before we break down the accuracy of body fat scales, it’s important to understand why exactly it’s so important to know what your percentage is – especially if you’re a novice when it comes to strength training or fat loss. The main reason why so many people abandon their New Year’s fitness goals sooner rather than later is without a doubt the fact that many of them don’t see noticeable progress within the first few weeks. They fail to realize that this is completely normal – fitness and lifestyle changes are more of a marathon than a sprint after all. Take for example an individual who is overweight. They join their local gym, start lifting weights, running on the treadmill, and making some tweaks to their eating habits. Yet, for the first few weeks, the weight on the scale hardly moves at all. You can imagine how easy it would be to get discouraged in a scenario such as this. However, what this individual might not realize is that they are indeed making progress – their body fat percentage could be shifting in a positive direction, even if the scale isn’t showing much progress. That same individual who was ready to throw in the towel because they thought all of their efforts were for nothing could very well be overjoyed if they saw how much progress they were making with their body fat percentage improvement. Even though the scale might not be showing much of a change, the simple act of reducing body fat can lead to marked improvements in overall health. So, now that we know why it can be so important to be aware of what your body fat percentage is, let’s take a look and see how accurate body fat scales really are – and if necessary, offer some helpful alternative methods for calculating your body fat percentage. There’s good news and bad news when it comes to how accurate many of the body fat scales available on the market are. First, the good news – many of these scales are incredibly affordable. You can purchase a brand new body fat scale for less than $20 in some cases. They’re also incredibly easy to use. Simply step on the scale and get your reading. Body fat scales work by sending an electrical current from the metal plates in the scale through your body and calculating how long it takes to pass through. It attempts to gauge your total amount of lean muscle mass, water content, and body fat with this current. 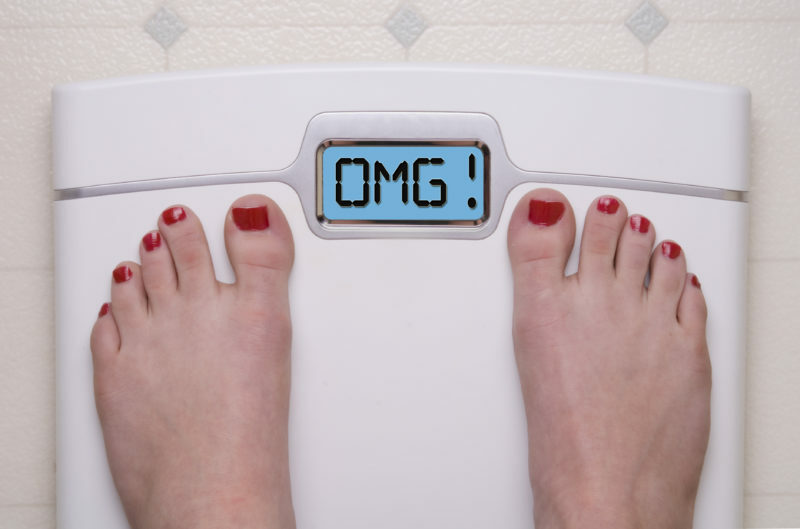 Now for the bad news – the truth of the matter is that many body fat scales are completely inaccurate. The simple act of drinking a glass of water can throw off your body fat reading by as much as 10%. With that being said, there are still indeed some benefits that can be gained from using a body fat scale. In spite of the fact that the accuracy can vary wildly, they can still be good for getting a general baseline idea of where you stand with your body fat percentage. Combine that with their ease of use and body fat scales can be a good starting point for calculating your percentage. The accuracy of body fat scales can also improve somewhat if you pick up a higher end model. Sure, the $20 option might not be very reliable when it comes to accuracy. But the $200 body fat scale with more complex features? That product could be much closer to displaying your true body fat percentage than the cheaper alternative. In the end, a body fat scale isn’t a bad option at all (especially for anyone who is new to trying to improve their health and fitness). The fact that they are so affordable and easy to use are undoubtedly huge benefits. While their accuracy can be hit or miss, they’re still a great way to figure out a baseline body fat percentage and then track changes from there. 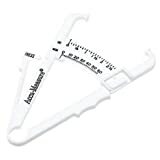 There are a few different ways to use calipers, all of which involve pinching folds of skin on certain parts of your body and recording the measurements. An ideal option for young, healthy men to get an accurate reading (other demographics tend to get less accurate readings), DEXA scans are primarily used to measure bone density, but they can also reveal your body fat percentage as well. Many local universities and colleges offer this option which involves submerging yourself in a pool, sitting on a stool, and then exhaling as hard as you can while a machine measures your weight. If you’re a complete beginner, it honestly doesn’t matter too much which method you decide to go with. The important thing is to just remain consistent with your training, diet, and (perhaps most importantly), recording your progress. This includes your reps, weight, and body fat percentage. Each one of those categories on their own might not change too much on a weekly basis, but when you put them all together, it won’t take very long at all for you to notice all of the improvements you’ve been making!